After the death of abu-ʿUbaid, who was the first to be directed by ʿUmar to al-Kûfah, ʿUmar directed Jarîr ibn-ʿAbdallâh there, saying, Wouldst thou go to al-ʿIrâḳ if I allow thee one-third of the spoils after the [usual] fifth has been taken? and Jarîr said, I will . Source: al-Balādhurī, Expugnationis regionum, 253 (Arabic); English translation from idem, Origins, I 406. The Bajîlah tribe constituted one-fourth of the Moslems in the battle of al-Ḳâdisîyah, and ʿUmar had allotted them one-fourth of as-Sawâd. Once when Jarîr [b. ʿAbd-Allāh] called on ʿUmar, the latter said, Had I not been responsible for what I divide (lawlā innī qāsim al-masʾul), I would leave to you the share already given; but I see that the Muslims have multiplied, so ye have to restore what ye have taken . Jarîr and the others did as ʿUmar said and ʿUmar offered Jarîr 80 dînârs. A woman of the tribe of Bajîlah, called umm-Kurz, came to ʿUmar and said, My father died and his share in as-Sawâd holds good. I shall never deliver it! ʿUmar turned to her and said, But, umm-Kurz, thy people have all consented to do so . I shall never consent , said she, unless thou carry me on a submissive she-camel covered with a red nappy mantle (qaṭīfah) and fill both my hands with gold , which ʿUmar did. Source: al-Balādhurī, Expugnationis regionum, 267 (Arabic); English translation from idem, Origins, I 424-425. (Cf. Abū Yūsuf, 1.1). ʿUmar gave to the Bajîlah one-quarter of as-Sawâd which they held for three years. Source: al-Balādhurī, Expugnationis regionum, 267 (Arabic); English translation from idem, Origins, I 425. Jarîr ibn-ʿAbdallâh accompanied by ʿAmmâr ibn-Yâsir called on ʿUmar who said, Had I not been held responsible for what I divide, I would leave to you the shares already given, but I see now that ye ought to restore what ye have taken . And they did, upon which ʿUmar offered a present of 80 dînârs to Jarîr. Source: al-Balādhurī, Expugnationis regionum, 267-268 (Arabic); English translation from idem, Origins, I 425. (Cf. Yaḥyā b. Ādam, 2.1). ʿUmar gave Jarîr ibn-ʿAbdallāh 400 dînârs. Source: al-Balādhurī, Expugnationis regionum, 268 (Arabic); English translation from idem, Origins, I 425. 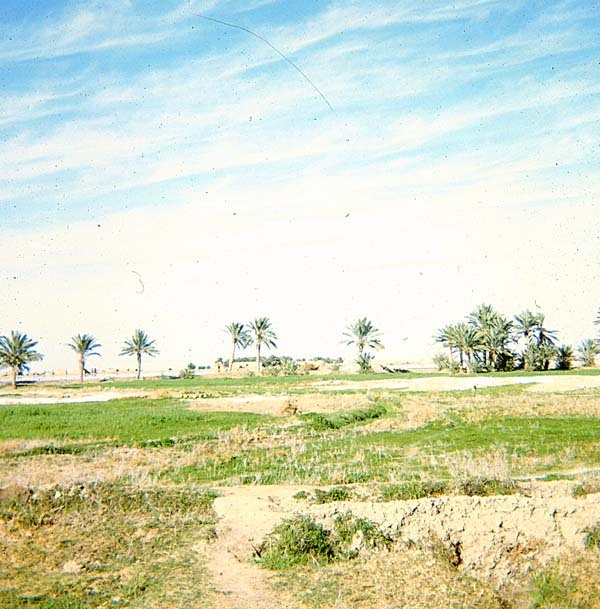 ʿUmar gave the Bajîlah, in exchange for the fourth of as-Sawâd they held, a stipend of 2,000 dirhams. ʿUmar allotted to Jarîr and his men one-quarter of what they had conquered in as-Sawâd. When the spoils of Jalûlâʾ were brought together, Jarîr demanded his quarter. Saʿd communicated the demand to ʿUmar who wrote back as follows: If Jarîr wants himself considered as having with his men, fought for a pay similar to the pay of al-Muʾallafah Ḳulūbuhum [sic; ‘those whose hearts are won to Islam by special gifts’; Qurʾān 9.60], then you may give them their pay. If, however, they have fought in Allah’s cause and will accept his remuneration, then they are part of the Muslims, having their rights and their obligations . Hearing that, Jarîr said, Truly and honestly has the Commander of the Believers spoken, We do not want our quarter . 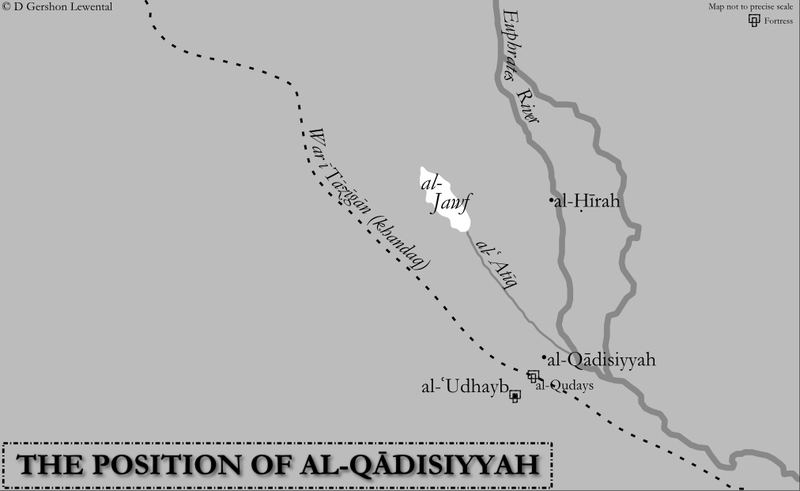 Map of the strategic position of al-Qādisiyyah. Source: D Gershon Lewental (DGLnotes). 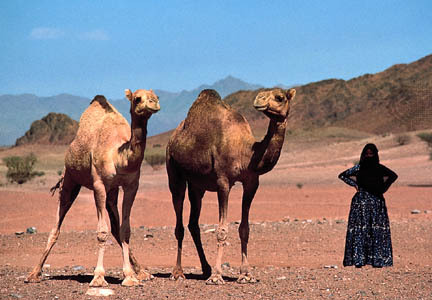 A Bedouin woman standing with two camels in the western Arabian Peninsula. Source: Encyclopædia Britannica.